Have backpack, will travel. That was my motto / tagline for some other social media site or internet profile from a while back. And it was quite long ago when I first discovered the Eagle Creek line of travel backpacks. Wow, that was almost 20 years ago when I did my Eurail-backpacking trip in Europe. I remember visiting REI and finding this wonderful, cool backpack that could easily be converted to carry-on luggage. All one had to do was unclip the shoulder straps and tuck them away into a zippered pocket. The hip belt also magically disappeared into the fabric. And what really sold me was the small daypack that attached to the main pack. Now I could leave my big backpack in the youth hostel and just carry my Lonely Planet guidebook, camera and snacks in my day pack for my day of sightseeing. 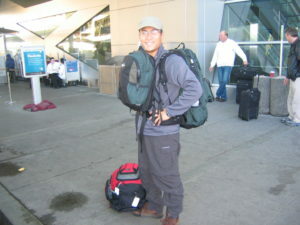 It was dependable, versatile, roomy and comfortable throughout my four months abroad. It served me well on subsequent trips, but alas, years later another model came out that had a few more bells and whistles, including a backpack rainfly that stored neatly underneath the pack until you needed it. I purchased that pack about ten years ago, and it has been my go-to travel bag for most of my trips that last over a week. It is still going strong but showing its age — I might just have to take a look at the newest models sooner than later! At any rate, Eagle Creek is not the only manufacturer that had a travel pack line — REI and Osprey make them, and I remember that Rick Steves even had a model for sale not too long ago. I prefer traveling with a backpack over a small rolling suitcase any day of the week — I like having both hands available instead of having to drag something behind me. Travelpacks are quite genius and work best when combined in tandem with packing cubes — but I’ll save that for another post!